The back area is difficult to access for care and massage. Seleective cleaning is desired. Our SCHURR cow-brush 2-brush-system fulfils optimal the demands and needs of your cows. Nowadays automatic cow-brushes are the standard equipment on the farms. the back of your cows! With one horizontal and one vertical brush a selective cleaning of the back, breast and sides is possible. 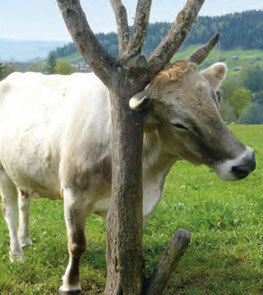 It’s an established fact that using our SCHURR 2-brush-system increases the well-being of your cows. the breast, sides and the head of your cows! Since 1992 there is for us only one solution for the full and complete cleaning and massage of milking cows - a 2-brush-system with horizontal and vertical brush. With no 1-brush-system, whether swinging or diagonal movement, you'll achieve the same effect as with a SCHURR -brush system! Use a 2-brush system to reach the highest possible cleaning and massage area. or ask us for our solution for zoo animals, donkey, horse or others - please contact us!